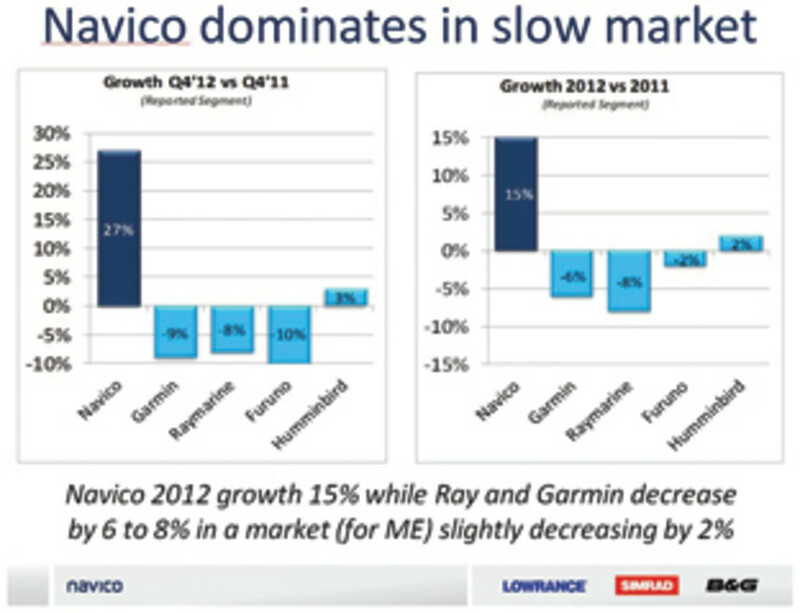 Is Navico leading the electronics segment? 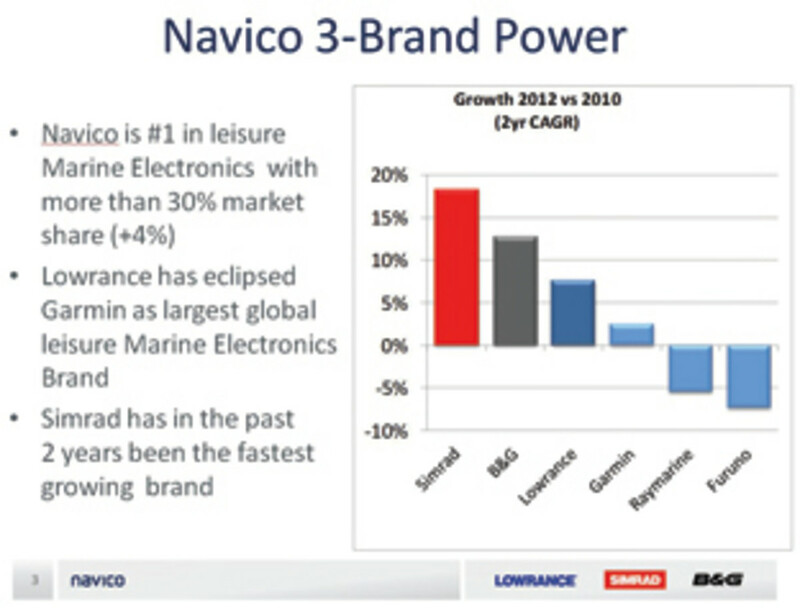 Navico, the parent company of the Lowrance, Simrad and B&G brands, has released figures that show it dominated a relatively slow marine electronics market during 2012. As a privately held corporation, Navico doesn’t have to reveal anything about its financial situation, but in late February it issued a press release claiming a dramatic 15 percent sales increase in 2012, which it says resulted in revenues of $256 million and EBITDA (earnings before interest, taxes, depreciation and amortization) of $41.4 million. Then, at a media event in Las Palmas, Spain, for its B&G brand, the mother company added some claims about how favorably its numbers compare to those of the competition (see accompanying charts). Is Navico painting a fair picture of where the recreational marine electronics market stands? The preponderance of privately held companies, or large public companies that don’t break out their recreational marine numbers, makes marine electronics sales comparisons difficult to come by. But Navico’s CFO says he’s 80 percent certain the figures Navico has compiled for its competitors (apparently gathered in several ways) are correct. A well-informed industry observer also told me that Navico numbers are quite realistic, except that, “Furuno didn’t do as badly as that.” In fact, he believes Furuno’s commercial marine electronics division has been doing great. Should the consumer care about things like market share in marine electronics, at least in the short term? My answer is yes, but not too much. When I recently created a Trawler Fest seminar about the state of primary navigation systems, I made the case that we’re no longer just buying a product, bolting it down near the helm and using it until it’s done. These days we’re choosing a primary electronics company to move forward with. There’s a good chance that a system the customer buys today will already have a software update available by the time it gets installed, and it’s reasonable to hope that the system will continue to get improvements and bug fixes for a long time, not to mention new integration options such as digital switching (Raymarine, Miami, 2013) or forward-looking sonar (Garmin, Miami, 2012). Trends toward cross-manufacturer interoperability, such as NMEA 2000 and easy tablet integration, ease the pain, but nonetheless, choosing a primary system is becoming a bigger and bigger decision for the consumer. As an occasional stock investor, though, I’m more interested in stories than numbers, and right now it looks to me as if the plot lines at all the major manufacturers are moving along nicely. Sure, Garmin’s marine division may have had a tough 2012 — with the camera disappointment and no other major releases — but no competitor is counting them out, that’s for sure. (And they all wish they had Garmin’s Quatix GPS watch.) And I suspect Raymarine’s sales decline is simply a hangover from the time when it was on the injured list (also once occupied by Navico) and that consumers are realizing how irrelevant that’s become. What I see now is a Big Four in saltwater marine electronics (Navico, Garmin, Raymarine and Furuno), all of which have streamlined operations with unified development, (fairly) efficient manufacturing and global distribution — a Big Four that is surfing a giant wave of innovation and integration. Today’s consumer can’t go too far wrong, in my opinion, though I still encourage lots of research to get the system best suited to one’s particular style of boating and gizmology. The recreational marine electronics segment is really a “cottage industry,” as the insiders joke. If Navico’s $256 million in 2012 revenues represents “more than 30 percent market share,” doesn’t that mean that the five largest manufacturers (freshwater-oriented Humminbird included) took in about $825 million? Heck, my local semirural health conglomerate has revenues of about $100 million. And consider, say, the iPad, which had sales of $10.7 billion just in the last quarter of 2012. Yes, if my math is correct, essentially one consumer electronics product (iPad models aren’t much different) generated revenues of $839 million dollars per week — more than the five leading marine electronics companies generate in a year. Ben Ellison is senior electronics editor for the AIM Marine Group, which includes Soundings Trade Only.